How would you rank your neighborhood on a scale from one to ten? The HUD-sponsored American Housing Survey asked just that. It's a very subjective question. Maybe we don't like to brag — or maybe we just like to complain. It’s fair to say, I think, that many folks in Seattle have strong feelings about their neighborhood, and like them just the way they are. Just look at the pushback when changes are proposed to zoning laws, for example. So I was surprised to see this result in a recently released large national housing survey: When asked to rate their overall opinion of their neighborhood, people in the Seattle area weren’t exactly effusive. In fact, we were the least likely to give our neighborhood top marks among any of the 25 metro areas currently available in the survey. 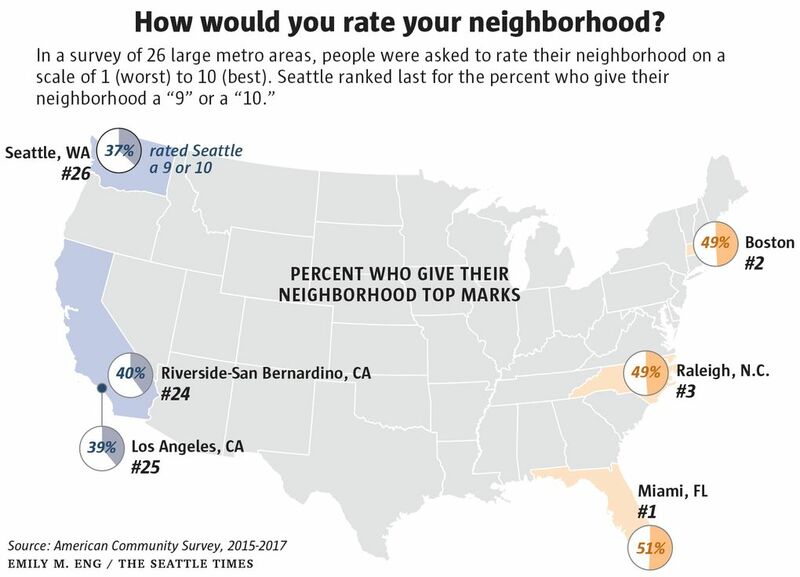 On a scale from one (worst) to 10 (best), just 37 percent of Seattle-area residents scored their neighborhood a nine or 10. That’s exactly 10 percentage points below the U.S. average. And compare Seattle with the Miami area, which ranked No. 1 among the metros for local pride — 51 percent scored their neighborhood a nine or 10. The data come from the 2017 American Housing Survey, which is the most comprehensive survey of housing data in the U.S. It is sponsored by the Department of Housing and Urban Development, and conducted every other year by the U.S. Census Bureau, which surveys about 115,000 households in selected metro areas. The survey has included the question about neighborhood opinion since 2015. 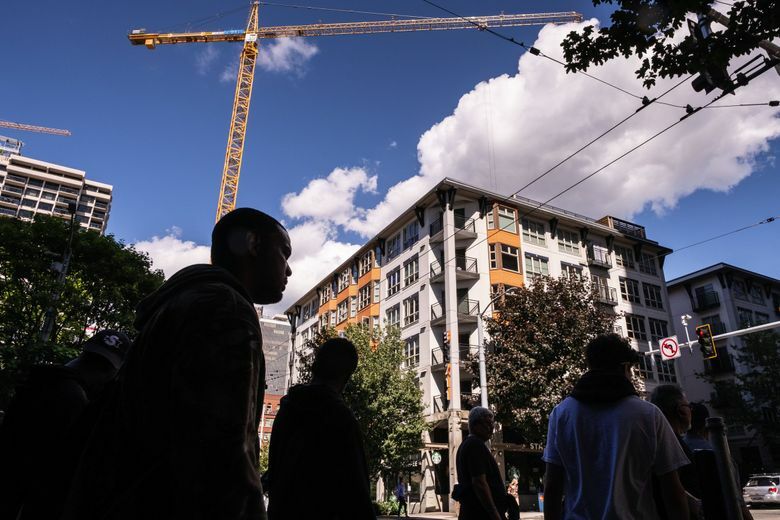 It’s a very subjective question, of course, and just because we’re stingy with nines and 10s in Seattle doesn’t mean our neighborhoods aren’t great. Maybe we don’t like to brag — or maybe we just like to complain. Whatever the case, I tried to find some clues in the data to figure out what was holding folks around here back from showing unconditional love to their neighborhood. I suspect that right now, some of my readers are thinking (or maybe screaming), “Property crime!” as they read this. They may, in fact, be on to something. Because overall, we give our neighborhoods high marks in most everything else covered by the survey. Relatively few of us said that we see signs of blight in our neighborhoods — things like abandoned or vandalized buildings, trash on the streets or on people’s lawns, or bars installed on windows. And the great majority of us think the schools in our neighborhoods are just fine. 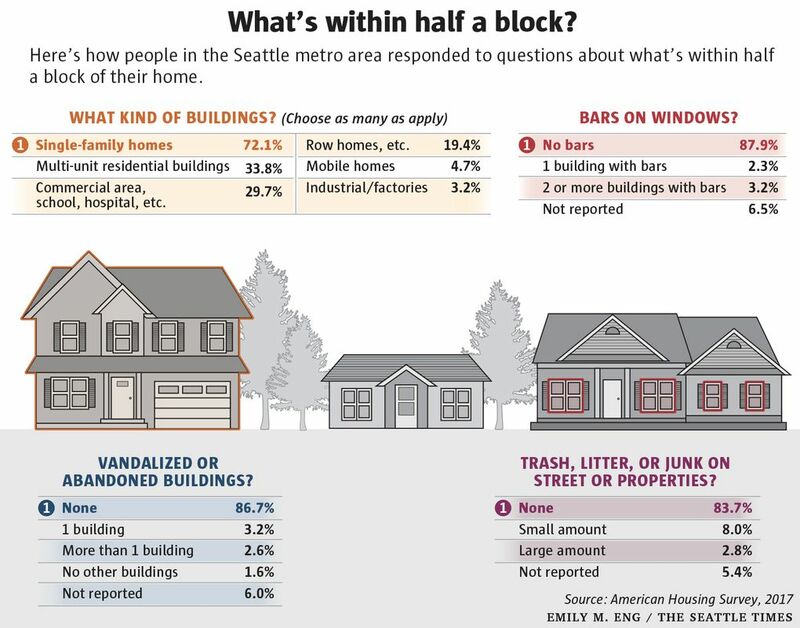 And then there’s property crime — or as the survey calls it, “petty crime.” More than one in five in the Seattle metro area agreed that their neighborhood had a lot of it. Among the 25 metros surveyed, Seattle had the seventh-highest response rate for petty crime (thankfully, Seattle ranks in the bottom half for what the survey calls “serious crime”). The lowest rate of concern over petty crime was in Raleigh, North Carolina, where just 8 percent said their neighborhood had a lot of it. And it’s true that property crime is a problem here. In recent FBI crime statistics, Seattle had the eighth-highest rate of reported property crime among the 50 largest U.S. cities. What do you want to know about the Seattle area? Submit your questions here. Looking deeper into the housing-survey data for the Seattle area, it shows that complaints of petty crime are relatively consistent among the different age groups, although younger people find it to be more of a problem than seniors do. There isn’t a tremendous difference based on income — except at the highest income bracket, where folks express less concern over petty crime. Interestingly, the big difference is between owning and renting. Among homeowners, just 17 percent said that their neighborhood had a lot of petty crime. That’s still high, but more than one-quarter of renters said it was an issue around where they live. In fact, renters tend to have a worse neighborhood experience almost across the board. The major exception to that is access to transit, and this could be the other area where Seattle-area neighborhoods come up short. To be sure, we do better than most metro areas when asked if our neighborhood has good bus or subway service: 60 percent of us say that it does. Nationally, the survey shows that the majority of people think transit in their neighborhood is bad. And if you were thinking Raleigh sounds great because of its low level of petty crime, consider that it also had the lowest response among the metro areas to the question about transit — a dismal 27 percent there said it was good. Even so, Seattle-area residents don’t express as much satisfaction with transit in their neighborhoods as you might think. We rank 11th among the metro areas, behind some places like Los Angeles and Riverside-San Bernardino. And in Portland, 68 percent say transit is good near their home, which ranks third behind New York and San Francisco. Transit is the one area where renters in the Seattle area like their neighborhoods a lot more than homeowners. Almost three-quarters of renters say they have good transit near them, compared with just half of homeowners. This isn’t too surprising, since apartments are more likely to be located in areas well-served by transit. None of this is to suggest that folks in Seattle don’t like their neighborhoods. The most common score here was eight, which is still very good. And only about 8 percent give their neighborhood a score of five or lower — that’s far from worst among the 25 metros. That distinction, with 12 percent of residents handing out an abysmal rating to their neighborhood, goes to Memphis, Tennessee.